Should I Use a Dummy Security Camera? 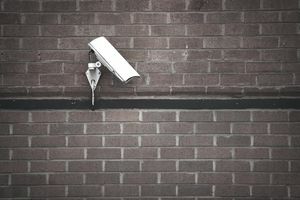 Video surveillance systems can provide businesses and homeowners with valuable information, in cases of theft, vandalism, or assaults that occur on their properties. But strategically situated video cameras may also deter such crimes from occurring in the first place. After all, criminals who notice a lens staring back at them are likely to move on to a safer target. For this reason, some businesses elect to hang dummy cameras on their walls. These devices are easy to install because they aren't actually electrically wired to anything, and they often look legitimate enough to fool the untrained eye. But some security experts recommend against this practice, reasoning that having no security is better than installing dummy cameras. In addition the obvious absence of wires, the biggest giveaway that a camera is fake, is the flashing red light in front of it. Why? Because a functional camera typically only has a small LED lights tucked away on the back of it—placed there merely to let technicians know that the power supply is connected. Consequently, experienced criminals who spot a flashing red light usually know the camera is phony. Some people integrate real cameras with dummy cameras in an attempt to confuse criminals. But this is also a questionable move, because criminals who can distinguish the between real and fake equipment can use this knowledge to their advantage by robbing only the parts of a store monitored by dummy cameras. Some business and homeowners have been sued for using dummy security cameras by crime victims who claimed that the fake cameras provided a false sense of security. An employee may deliberately park his car within view of a security camera, and he may likewise leave valuables inside the vehicle. But if he is attacked or if his car/valuables are stolen, he might ask his employer to review the security video. The chilling discovery that there is no video to be found might give the employee cause to sue. In such cases, defendants would not be held liable if they had no cameras at all.